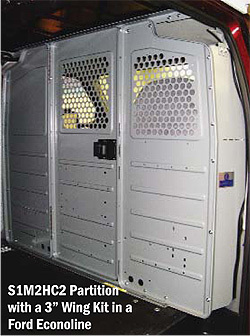 These heavy-duty partitions and bulkheads will work on all Ford full sized cargo vans and Ford Econoline van models. All hinged door partitions come standard with two 6” hinges, bulb seal and a slam latch. These features reduce vibration noise. 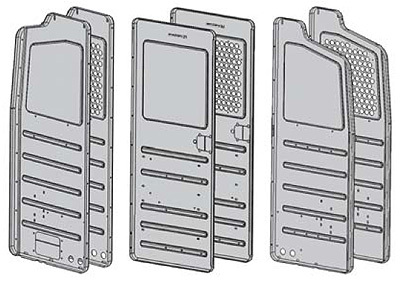 Partitions and bulkheads are sold as panel kits and wing kits. Please see application chart below to confirm the appropriate panel kit and wing kit for your vehicle. Partition panel kits and wing kits include assembly and installation fasteners for base van trim level. Higher trim levels may require modifying trim or partition. Wing kits are available in a standard position or an extended position for more leg room. Choose from solid or perforated top panels made from 18-gauge steel for strength and finished in a tough Steel-Cote powder coat paint. 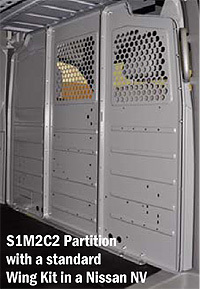 S-M-C Series partitions fit GM and Ford full size vans, and Nissan NV vans. Center M panels can be fixed or hinged with a key-locking door. Partitions are sold as panel kits and wing kits. Please see application chart to confirm the appropriate panel kit and wing kit for your vehicle. 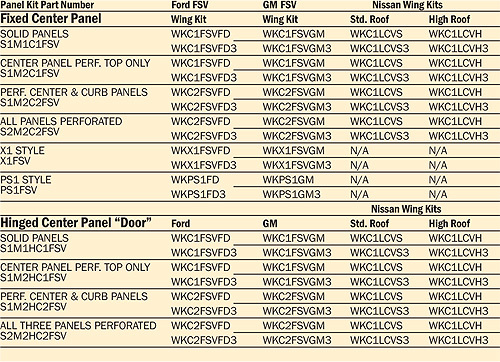 Partition panel kits and wing kits include assembly and installation fasteners for base van trim level. Higher trim levels may require modifying trim or partition.